How It’s New York: Fallen Angel Theatre Company is a New York company devoted to presenting plays by British and Irish playwrights for a New York audience. How It’s Irish: Aedin Moloney is Irish. Irish Repertory Theatre co-presents the show. And while Airswimming is set in England, warehousing women who’ve given birth out of wedlock has a sad history in Ireland, too. Kathy Callahan interviewed Aedin , who is starring in Airswimming at Irish Rep Theatre. 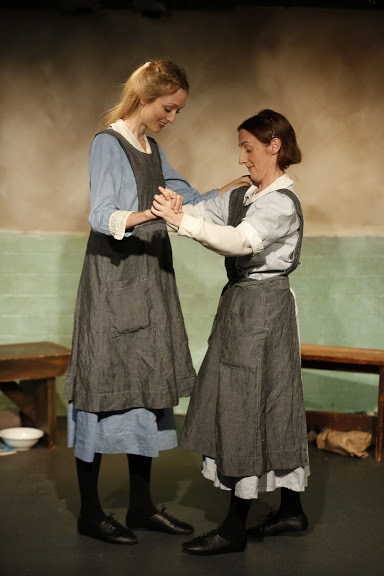 Aedin co-starred last season in Dancing at Lughnasa at Irish Rep (read our review here! ; Aedin talks about it on this podcast!). Director John Keating directed Eva the Chaste by Barbara Hammond for Fallen Angel in July 2012 (our review here!). The play by Charlotte Jones (Humble Boy; The Woman in White) opened on Sunday, Jan. 13, and runs through Sunday, Feb. 3. Aedin is the producer and artistic director of Fallen Angel Theatre Company. The play begins in the 1920s and goes through the 1970s, as Dora and Persephone, incarcerated in a hospital for the “criminally insane,” adopt alter-egos Dorph and Porph to survive. “The Stage is a good place to bring their stories to life,” says Aedin. NYIA: Aedin, please tell us your Airswimming backstory. John Keating brought this play to my attention in 2004, asking me if I would be interested in playing the role of Dora and producing it with Fallen Angel Theatre Company. In 2011 we found our Persephone – actor Rachel Pickup. In September 2012 the final piece to our production came about, when the renowned Irish Repertory Theatre came on board to present the piece in association with Fallen Angel Theatre Company. NYIA: Aedin, I have heard you say that Airswimming is a woman’s play that everyone can relate to on some level. Charlotte Jones has written a very brave piece that explores with effortless wit a topic (incarceration of women for having children out of wedlock) that many writers would shy away from. 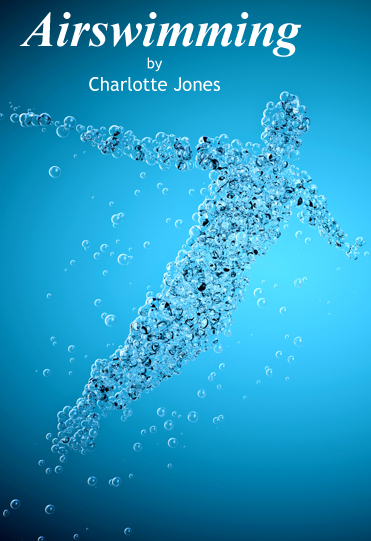 Charlotte Jones’ fearless humor and her complete lack of self-censorship in her writing, are more than reason enough to draw me to the challenges of the play. NYIA: Men and boys never suffered the tragic fate of girls and woman who were ostracized, incarcerated and deemed socially and mentally unfit in London and in Ireland at that time. True enough. That is why we must never forget. The stage is a good place to bring their stories to life. NYIA: John, what is on the horizon after Airswimming? I’m in rehearsals for Much Ado About Nothing at The Duke on 42nd Street, but I’m on the other side of the stage for this one, playing Verges and Friar Francis. We start previews on Feb 2 and it runs thru early April. Yes Kathy Airswimming definitely has strong echoes of My Dinner with Andre and of course Waiting for Godot, someone the other evening also mentioned The Shawshank Redemption, which I can see too! I’m excited about the Wallace Shawn mini-season this Spring in NYC and wish that My Dinner with Andre was part of it. NYIA: When and where were you when you decided to bring AirSwimming to NYC? I first read Airswimming after picking it up by chance in Drama Bookshop as far back as 2004, I bought it after reading it there and then an hour later, showed it to Aedin that weekend, we decided to do it right away – and here we are nearly 9 years later! NYIA: I can see Airswimming on the screen. Any plans for filming? No plans to film it – wish we did as it would work so well, I would be surprised if the playwright Charlotte Jones hasn’t been approached over the years (the play was written in 1997) to adapt it for screen. 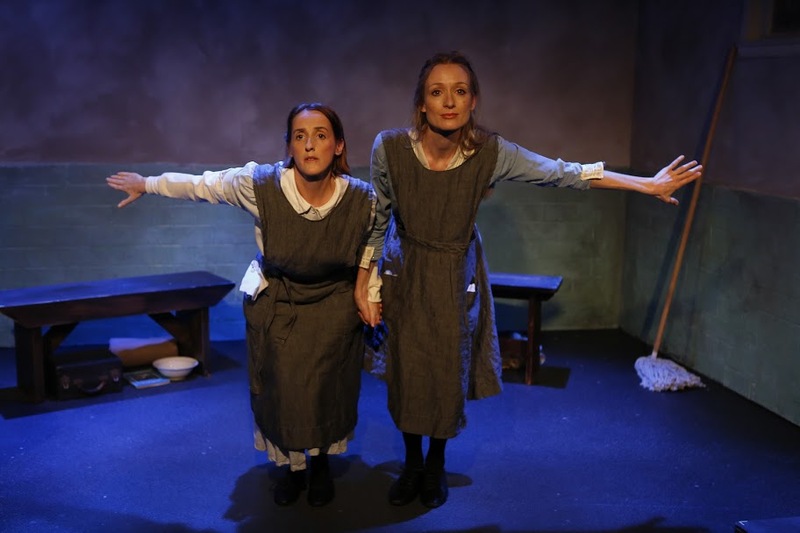 I can see the pitch now – “Shawshank, but with two ladies in the Freeman and Robbins roles!” They should ask Aedin and Rachel to do the parts, they won’t find better to play them. And if I might add, John, They should ask you to direct! Thousands of men and boys were, in fact, ‘ostracized, incarcerated and deemed socially and mentally unfit..’ throughout the 20th century in Ireland. The industrial schools and the asylums were filled with children and adults who were neglected, or unwanted, or orphaned, or otherwise deemed unwanted and unproductive. I’m a little surprised to read that claim. PLEASE PLEASE FILM THIS PERFORMANCE!!!! Saw Ms Pickup and Aedin Moloney in Airswimming by Charlotte Jones and was so blown away by her dazzling performance I was besides myself with how to say thank you. This avid theatre goer and NYC native left the theatre w a friend and both thought it might have just been the best play AND performances we can ever recall seeing. One leaves the theatre with such enormous appreciation and doesn’t know what to do with it so I found this space to write and hope Ms Pickup and Ms Maloney gets this and knows they have reached a pinnacle of acting that astounds me.